looking for cheap but quality rooms that are great value for money. 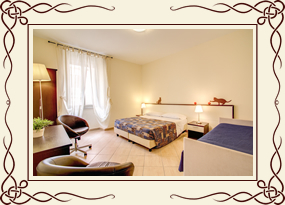 The Mrs Julie Guest House Rome offers 14 comfortable and spacious guest rooms in a variety of sizes. Each room is decorated in a simple and modern style that is both chic and comfortable with new furnishings and rich fabrics. 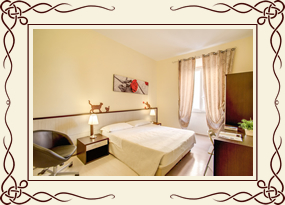 Each room also enjoys a host of mod cons including free WI-FI, personal safety deposit box, writing desk and a mini fridge. 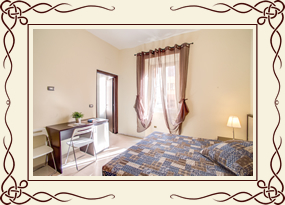 Five of the rooms also offer satellite TV and a private en-suite bathroom with shower. Take a look at our Photo Gallery page to see for yourself how nice and comfortable our rooms are and when completely satisfied, make use of our online booking system to get the lowest possible prices through this – our Official Site. 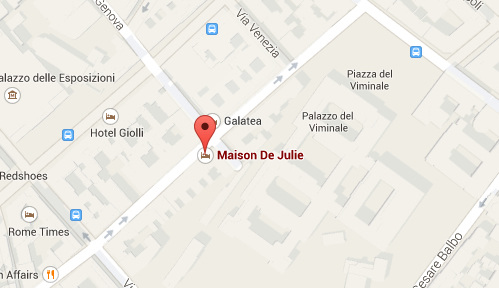 Located in the trendy district of Monti, the Mrs Julie Guest House is situated in one of the most ancient areas of Rome and within walking distance of a multitude of tourist attractions. Within a few moments, guests can walk to sights such as the Coliseum, the Imperial Roman Forum, the golden Basilica of Santa Maria Maggore, the Opera House, the Quirinale Palace, Piazza Venezia and the Trevi Fountain to name but a few. Guests also have access to the city’s two metro underground lines within a 5-10 minutes walk which means that guests can see all of the main attractions within moments including the Vatican, Sistine Chapel and the Basilica of St Paul. Take a look at our Location page for more information. Site Designed and Maintained by: Fisheyes Ltd.